Tag Archive | "Tetraodon lineatus"
The Fahaka Puffer (Tetraodon lineatus) is also known to tropical fish keeping enthusiasts as the Nile Puffer, Striped Puffer, Band Puffer, Lineatus puffer, and Globe Fish. They inhabit large rivers, open waters that are weedy and densely vegetated, and are found in the Nile, Niger, Volta, Gambia, Geba, Chad basin, and Senegal Rivers in Africa. The Fahaka Puffer is a very large fish that grows to 18 inches or more in length, however a sub-species called Tetraodon fahaka rudolfianus only grows to about 3 inches in length, making it a more suitable species for tropical fish keeping enthusiasts. The Fahaka Puffer is a solitary, stocky, elongated fish that is covered with short prickles. The back of its body is colored a brownish gray that gradually gets lighter until it ends into the whitish belly. 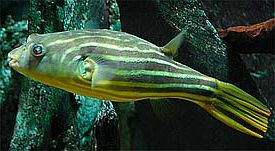 The Fahaka Puffer has bright orange to red eyes and a series of light, almost golden colored, horizontal stripes that run from the pectoral fins back across the tail; hence the a.k.a.s “Striped Puffer” and “Band Puffer“. Juvenile Fahaka Puffers are more mottled in appearance and as they get older, their colors become more vivid. Like the Bornean Red-Eye Puffer (Carinotetraodon borneensis), these puffer fish change color depending on their mood, age and environment. All puffer fish have the ability to puff themselves up with air or water when threatened and Fahaka Puffers are no exception. In addition to this defense mechanism, toxic substances in their flesh make them poisonous when eaten. In the wild Fahaka Puffers feed on oysters, mussels, cockles, krill and other mollusks. In an aquarium environment they should be offered a variety of human quality hard shelled foods to keep their teeth worn down. This includes snails, shellfish, crustaceans, lobster, crab legs, and clams. Avoid giving them “feeder” fish which may pass on diseases. If their teeth grow too long, they need to be clipped with cuticle cutters on a regular basis. Fahaka Puffers are a solitary and extremely aggressive species that cannot be kept with other species. When confined with others of their own kind, a battle will immediately ensue unless they are housed in an extremely large tank. Despite their aggressiveness with other fish, Fahaka Puffers make excellent aquarium “pets”. They are one species that actually bond with their owners and make friendly, entertaining, expressive, almost human like pets. Puffers do not have gill covers or scales and are more susceptible to diseases, nitrite, nitrate, and ammonia levels. They are also messy eaters, often leaving uneaten food on the bottom of their tank. This makes a 125 gallon or larger aquarium with highly filtered water a must for Fahaka Puffers. Large, powerful, canister filters that can turn the tank water over 6 to 10 times an hour are a must for these fish, as are weekly water changes of 30% – 50%. Their accommodations should also include moderate to normal lighting, some smooth rocks, driftwood , and a sandy or extremely fine gravel substrate. Although in the wild they are found around densely vegetated weedy areas, live plants will for the most part be destroyed during feeding and should probably be avoided in an aquarium environment. Although it has been accomplished, breeding the Fahaka Puffer in an aquarium is extremely difficult if not impossible. They will normally kill each other on sight and in their natural habitat when they do breed, it is normally at a depth of 50 feet or more. When the female Fahaka Puffer produces an ovipositor organ, they will mate with any willing male. The male puffer swims upside down under the female and grips the female so that both sexual organs connect. Eggs and sperm are released several times to fertilize thousands of eggs during a spawning. The fertilized eggs should be removed to a separate brood tank once they sink to the bottom of the breeding tank, where they will hatch in 3 to 4 days. After hatching, the water level should be lowered to give the fry easier access to the surface. After a week the fry will be free swimming and should constantly be fed infusoria to prevent starvation. As the fry grow into their second week, they can be introduced to baby brine shrimp . As they grow, the fry will become more and more aggressive, so its a good idea to “cull” out the larger, more aggressive fish to separate tanks. Fahaka Puffers are not common in the aquarium hobby and when available are usually adults or juveniles of 1″- 2″ in length.